Never voted her BUT at least she had the balls to step up despite being a remainer herself and try to enact the will of the people, where as BJ JRM who were pushing for Brexit all took a step back, it was always going to be a snipshow and the mummys boys did not want there CV ruining, I bet any money the either BJ or JRM will run for leader of the conservatives not long after Miss May has fell on her sword, as blunt as it may be. I think she will be calm, she at least has remained true to her own values while others have descened into trash talk, I will be playing Mutant Year Zero though at the time, the future there seems more stable. She is doing everything BUT carrying out the will of the people. She promised 50 times that we would leave the EU on 29th March 2019. Now she is begging for an extension and she went all in on a crappy deal whilst attempting to take no deal off the table - she is working FOR the EU. She needs a holiday, a very long one at that. 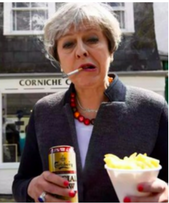 I would love it if she came out, half-cut, had a rant, then finished of by saying "# it, you lot deal with it am done..."
She's getting last minute edits from Tusk. I don't understand how the conservative party of your country ended up with somebody who, from what I've read, was a remainer? I'm sure there were plenty of actual leavers that could have stood up to the PMs role. The Reese Moggs guy, has he a put a challenge to May? Farage? He left as soon as the Brexit vote was done? I see a lot of outraged leavers but no leaver is stepping up to the plate to take charge?? The traitorous b*tch just put a 'stay' choice into the mix for MP's to consider. Slipped it in there. Nigel was leader of a different party, UKIP. He was frozen out of everything by the conservatives. So her deal and that's it, but not this month, June instead.